You are instructed on the paper to respond to one or more of the quotes listed on it. Writing ‘creatively’ does not excuse you from this requirement. It is helpful to write the quote you are responding to at the top of your work, so that it is clear to the examiner what is happening. Make it easy for them to follow you. Through your writing it is critical that you prove to the examiner that you understand the chosen quote. Both the explicit and subtle meanings of the quote should be explored and expressed in whatever story you weave. Bottom line: it should be clear from reading your story what you think the quote means. There are many ways to make this happen. You can write a story in which the main character learns the meaning of the quote and applies it to her life. Or you could write one where the quote is the moral of the story. Or you could show what the quote means by imagining a world where the opposite is true. For example, in The Lion King, Mufasa seeks to teach his son Simba about ‘the circle of life’ and how all the animals and plants in their kingdom rely on each other to thrive. Later on in the story we see Scar take over as the king of the lions. His expression of greed and malice disrupts the natural circular flow of resources in the pridelands which turn to wastes as a result. In this story we learn about what the circle of life is by witnessing its abolition. Stories communicate meaning and understanding in subtle ways. It is important not to sacrifice the examiner’s ease of reading your work in pursuit of dramatic and beautifully creative sentences. Don’t worry about being too stylish with your storycrafting language. Use the words that come naturally to you. You don’t get points for being ‘more creative’ – you don’t get more for using obscure words that are rarely seen together, or inventing an entirely new type of plot arc. The most important thing above all is that your work is easy to read and easy to follow. Remember, these examiners have been correcting long, boring, confusing essays all day long. Write them a nice, easy to read and informative story and they will love you for it. Below is one example of how you can respond to a quote – and show what it means – by telling a story. Keeping him in the cage was simple. Their method: distraction. Winston woke, as he usually did, under the big chestnut tree by the stream. As his eyes attuned to the morning light his mind began to populate with thoughts, ideas and sounds. What would he do today? What would he discover? And oooh, what would he eat. That was the big question. Winston lived in a natural grassy pasture with lots of trees and bushes and flowers. The big chestnut tree marked the centrepoint of his home, next to which flowed a little stream, which seemed to emerge from an underground well, and trickle out as if to nowhere. He liked to sleep near the stream in case he found himself thirsty in the night. Despite the apparent greenery, there was no other source of water for miles around. Years ago, on initial exploration of his environment, Winston also discovered a series of mysterious packages. He would find these little brown boxes under bushes, hanging from trees and sometimes waiting at his feet when he awoke in the morning. Gradually he noticed a pattern, and with accuracy learned to predict where he would find a supply package on any given day. The supplies were food and alcohol. The food could be anything. It was different every day. That’s what made the packages so mysterious. Always in the same locations, dropped within a mile or so of the big chestnut tree, but always containing something new, delicious and satisfying. One day Winston, out of curiosity, began to explore beyond where he typically found his mystery boxes. With the chestnut tree to his back he began to walk. He kept walking for several hours as the foliage around him became sparse and the grass turned to sand. Ten miles out he came to a tall grey fence blocking his path. Most animals, when they come to a barrier they cannot easily pass, just turn around and go the other way. Humans like Winston, however, are a stubborn bunch. They will stand there and wonder at it. They will suppose what might be beyond it and attempt means of discovery. They might wonder at the purpose and origin of the barrier. Who made it? Who put it here? And what do they want? Winston stood in awe of the red and orange expanse that lay beyond the fence. It wasn’t a very thick fence, he thought. Perhaps he could break it if he kicked it for a while. Or maybe he could climb over. Winston thought for a moment about climbing over the fence, but he was unsure if he would find food out there, and by now he was getting hungry again. He was hungry for food. Hungry for drink. The gate could wait. His interest in what lies beyond already dwindled in the shadow of his more pressing desires. With an expectant and hopeful spring in his step Winston set off back towards the centre of the enclosure, giving no further thought to that which binds him. If you were surprised to discover that you can write stories on the GAMSAT, maybe you should check out my book. 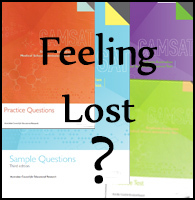 It contains lots of info about what you can and can’t do on GAMSAT Section 2.